Isn’t pita bread kind of neat? I don’t know, something about a pocket being inside your bread to stuff things into. And don’t even get me started on watching them puff up in the oven when you make them yourself! 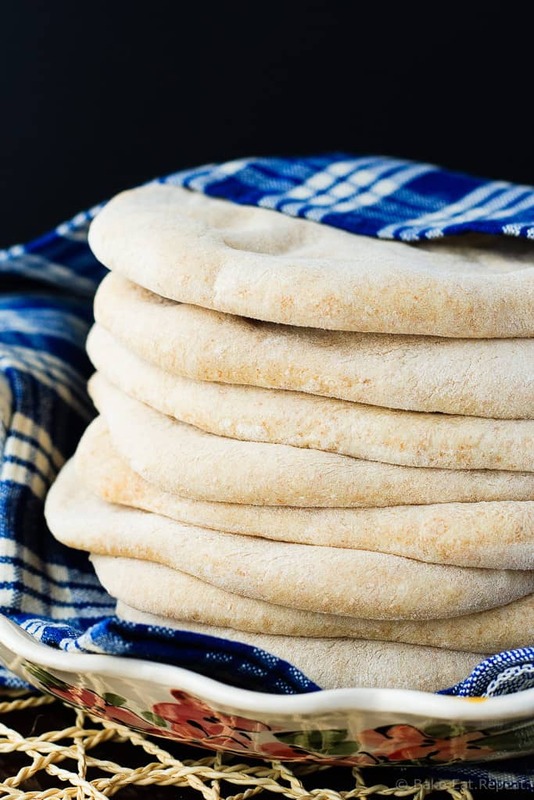 Homemade pita bread is even cooler than the store-bought stuff. I don’t even need to tell you that it tastes way better too! That’s just a given I think. Homemade bread is pretty much always better. These homemade whole wheat pitas are pretty fantastic. I’ve tried many, many recipes for pita bread, and have always liked it, but it’s never been amazing. Usually a little thick, a bit dry, and rather undependable in the puffing department. And that’s just plain disappointing when you have a bunch of kids staring into the oven waiting for the magical puffing bread to balloon up in the oven and it doesn’t happen! Now I won’t say that these will all puff up without fail every single time you make them. They probably won’t. But this recipe does work a thousand times better than any other one I’ve ever tried. Plus, it’s faster, easier and tastes better too. That’s a winning recipe in my books! The trick is to flip the pitas over onto the hot stone or prepared baking sheet so the side that was resting on the countertop while rising is facing up in the oven. Having the side of the bread that is not as dry facing up in the hot oven helps with the puffing. So does rolling them out as evenly as possible. I find that this is easier to do if you try to roll them out with as few rolls as possible, and to keep the surface you’re rolling on lightly floured so you don’t have bits of your pita bread sticking to the countertop. 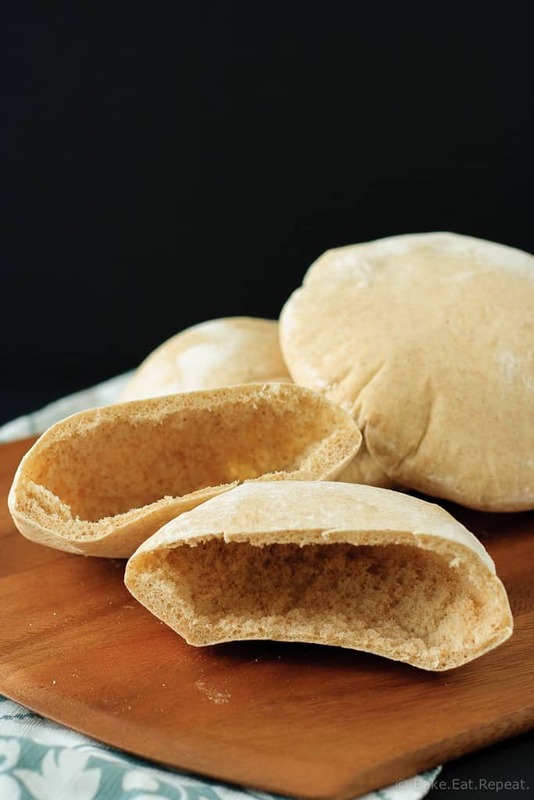 Regardless of how many of your pitas do the magical puffing trick in the oven though, this pita bread still tastes amazing, even as flatbread! So you definitely need to make it soon even if you think yours won’t puff. And when they DO puff up for you, it’ll be really exciting! You know, for the kids. Note: We prefer these to be whole wheat, but you can easily make them with completely all-purpose flour instead if you prefer. They’re delicious either way! Make sure not to overflour the dough, just add enough flour to have the dough clearing the sides of the bowl, but it should be a soft, smooth dough, not stiff at all. Start with the 1 1/2 cups of whole wheat flour and add more only if necessary, if your dough is really sticky. In the bowl of a stand mixer, or a large bowl, combine the yeast, warm water, salt, all-purpose flour, and 1 1/2 cups of the whole wheat flour. With the dough hook attachment, mix to combine all the ingredients. The dough should come together and start to clear the sides of the bowl quite quickly, if it remains really sticky after about a minute of mixing, add more flour, a couple tablespoons at a time until it clears the sides of the bowl. Knead the dough for 4-5 minutes with a machine, and 8-10 minutes by hand, until it is smooth and elastic, and just tacky to the touch, but not overly sticky. Turn the dough out onto a lightly floured countertop and divide it into six equal pieces. Roll each piece into a ball and cover the dough pieces with a clean towel and allow to rest for 10-15 minutes. On a lightly floured surface, roll out each piece of dough into a round disc, about 1/4 inch thick, keeping it as even as possible. If you end up with really thin sections they probably won’t puff as well in the oven. Leave the discs on the counter, covered with a clean towel, to rest and rise slightly, for 30-45 minutes. Preheat the oven to 425 degrees F. If you have a baking stone, place it in the oven to heat up at the same time. If not, line a baking sheet with parchment paper. When you’re ready to bake, pick up one pita at a time carefully, and flip it onto the hot stone, turning it so the drier side (the one that was facing up) is now on the stone (or lined baking sheet). The side that was on the counter will be more moist and the pita will puff better if this side is facing up. If it’s really dry too you can spray them lightly with some water but I didn’t find this was necessary. Bake the pitas (I baked 3 at a time, the others are fine resting on the counter a little longer) for 8-10 minutes until they are lightly browned and puffed up. Sometimes a pita doesn’t puff up, but it is still ready so don’t leave it in longer. It can still be used as flatbread! Let the pitas cool completely on a wire rack. They keep well at room temperature for a couple of days, or can be frozen once they’ve cooled. Source: Adapted very slightly from Under the High Chair via Mel’s Kitchen Cafe . Why not mist the top of the pita just before you place it in the hot oven? This will save turning the pita over on the baking stop and risking a deformed round. I often mist the top of my breads to keep them from forming a harder surface during oven rising. They puffed up great! Nice chewy yummy bread. Thanks Jackie - I'm so glad they turned out well for you! Thanks Jess! Hope you like them! I'm so excited to try my hand at this! I love pita bread, and I've never made my own before! Hope you like them! Thanks Jaren! So I have totally tried making pita bread and failed. They didn't want to puff up at all then just tasted blah. These look perfect and delicious. Since my hubby is Pakistani we eat our fair share of pita bread here, so I need to try this asap!! Pinned!! Yeah, I've tried plenty of pita recipes that didn't work at all, so this one made me really happy! these ones actually looked and tasted the way they're supposed to! Thanks Cyndi! You should definitely try it out Valya, you'll love them! Thanks! I'm totally trying your trick to get them to puff - yours look superb! It works well - I can't take credit for figuring that one out though, it was on the original recipe, but I loved how well it worked to get them to puff up! Thanks! Oh of course they will - and besides, even the ones that don't turn out still taste great! :) Thanks Kacey! Pitas are the best! Never thought of making them at home before. Awesome idea! I love the idea of making my own pita! This would be perfect on my Greek style meatballs I just posted! I have to make pita bread, sounds easy. At my store the pita bread is not fresh, I have to drive 20 minutes to a lebanese grocery store to find fresh pita bread. Yeah, it's kind of hard to find fresh, that's why I was so happy to finally find a good recipe for it! And it's even easy! These look perfect Stacey! Love them! never had much success with making pita bread, but you definitely inspire me to try it! Pinned! You definitely should Mira - this recipe was great! Thanks! I tried making pita bread many years ago, and it was the ugliest, non-puffy pita bread ever :/ Unlike yours! Looks so perfect and delicious! Thanks Denise! I've made really ugly, non puffing pita bread many many times - this recipe actually works so it made me really happy! Ahhhhhh, my pita bread NEVER looks as beautiful as yours Stacey! So, when are you moving to Colorado so you can teach me all of your tricks? ;) Love this times a million! Hahaha, why don't you move here? :) Mine has never looked this beautiful before, that's why I had to share this recipe, it actually works! Thanks Justine! You should definitely try it - so good! Thanks Ashley! 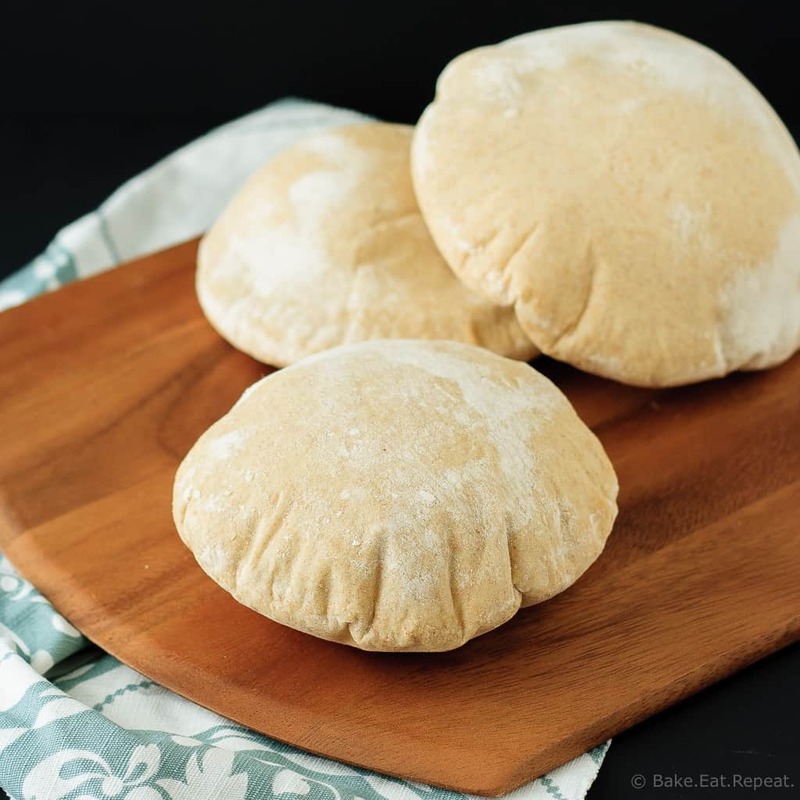 I love the idea of making your own pita bread, Stacey! This looks fantastic! Definitely next on my list to try out! Just beautiful! Your pita bread looks perfect, Stacey! I can't wait to try this! Your pita looks so perfect, Stacey! I need to try making my own soon. I love pita bread. Especially with chicken salad or egg salad, can't wait to make up a batch to enjoy! You got some mad skills!! That bread is beautiful!